Ben Tweel is Build Buildings. While Tweel's proper name and his recording moniker may be unknown to the masses, both are worthy of unchecked praise; anyone with a penchant for electronic music, particularly the glitch-hop and experimental ambient subgenres, will find plenty of reason to take note. The story behind Tweel's passionate and creative drive for making music is not all that different from the hundreds of thousands of other digital beatmakers out there. 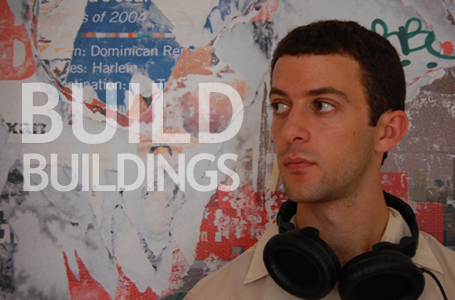 However, Build Buildings is no hired DJ mercenary ravaging for club recognition and banger-name association buzz. The most unique thing about Tweel's story is that he makes criminally overlooked music in his spare time, sometimes putting in as much as 80 hours in a single week, between a hospital job, med school preparation, and otherwise further refining his professions as a scientist and philologist. Despite life's tensions Tweel, as Build Buildings, has been delivering consistent and high-quality electronic compositions at a relentless pace, with two EPs (Isomers EP, a project with Marlo Bright, and I Sat On The Roof) and three full-length albums (New Animals (Desmostylus), There's a Problem With My Tape Recorder, and the just-released Ceiling Lights From Street) to his credit. To boot, Tweel seems like a genuinely nice chap. Recently Ben Tweel took some time out of his busy schedule to answer a few questions from LAS writer Josh Zanger. It says on your website that you are a scientist and philologist. What does that mean you do on a day-to-day occupational basis? For the past few years I worked in research science, which I think informed a lot of the aesthetic of the music I made at the time. I would wear headphones around the lab while I was working on There's a Problem With My Tape Recorder [Tweel's 2004 album], and I would always notice the sounds of the lab equipment leaking through my headphones. I found these incidental sounds integral to the way I enjoyed my music, and I designed that album to leave enough room in the music for the incidental sounds of life to bleed in. I'm now in medical school, which has exposed me to a whole new world of accidental music! Have you had any formal musical training over the years? I took piano lessons when I was little, jazz guitar in high school, and I studied electronic music in college. But I've taught myself to play pretty much any instrument I could get my hands on: accordion, mbira, theremin, harmonica. I like the fresh perspective I get on an instrument when I know just enough to make music with it, but I don't know how it's supposed to be played. You have been quietly making exceptional music since 2004. What keeps you writing and releasing albums even though you haven't gone quadruple platinum or been on the cover of Rolling Stone? Making music is a compulsion for me, and I'll keep making music even when no one's writing about it. For me, it's much more important to get my music to the right people than to the most people. Many young sound producers are ultimately drawn to whatever music form is hot at the moment - whether that may be techno, dance mash-ups, electronic hip-hop beat production, or whatever. What initially drew you to start crafting music in the style that you do, since it doesn't really meet any specific criteria? I've always been a big fan of musicians that put the production and the sound of the music first, regardless of genre. So for me, I never really gave much thought to the genre of music I create, except that I make instrumental music, which necessarily draws more attention to the sound and the production than does vocal music. But beyond that, the style of music I make is my speaking voice in music. I don't sit down to decide beforehand what something is going to sound like - I just start to speak and this music comes out. All my tracks start with me recording samples at home. These samples might be household sounds, clips from old records, or recordings of me playing whatever instrument is handy; Rhodes piano, guitar, melodica, toy keyboard... A lot of times, I'll be milling around the house, and happen to notice a great noise, like the sound of a chopstick falling on my cutting board, or setting down sunglasses on my stereo. I'll record this sound, and more percussive sounds from the same type of environment, like other cooking sounds, which I'll then turn into the basis for a percussion track. As I build the melodic components of a track, I always focus on the sound and the ambience of the song. I have sound-color synesthesia, which means that sounds, melodies and timbres are associated with colors in my brain. I actually use this to figure out how I can build the song in a way that complements itself. Like, if I'm working on something that is very blue, or green, I might decide that it needs a little yellow or bright gray for balance. I do the bulk of my computer sample-tweaking in a program called SoundMaker for Mac OS Classic. I've actually been using this program almost exclusively for over 10 years, which I know is a lifetime in electronic music. I assemble tracks in ProTools, but I try to keep the plug-ins to a minimum. I want the music to be about sound, not just ready-made effects. For your sound-color synesthesia, what are the characteristic differences of the way you think of, say, a "yellow" sound versus a "purple" sound versus a "black" sound? Is there one sound-color that you are particularly fond of using or capturing? The color I experience with a sound has to do with the pitch, timbre and mood. Low notes tend to be darker, with a deep sub-bass being nearly black, and high notes tend toward yellow or even white. A major chord might have more red elements relative to that same minor chord, which might have some brown or gray character. Mostly, though, timbre and instrumentation dominate the way I experience a sound. Instruments rich in overtones - like accordion, piano, guitar - have thick, woven qualities to their sounds, with different hues represented. Pure piano is mainly blue, but a given note has elements of many different blues within it; Rhodes piano is a rich purple; acoustic guitar has a brown to purple range of hues. Electronic and computer manipulation of sounds opens up a huge range of color possibilities, though, that don't exist in organic instruments - at least without processing. That is really the main reason I'm attracted to electronic music. On Ceiling Lights from Street I aimed to capture sounds in the blue-purple-pink range. A lot of this started with guitar - electric or 12-string acoustic - which was then tweaked in an audio editor. For instance, the initial attack of a guitar chord has a lot of atonal elements of the pick or fingers hitting the strings, which translates to a silver or brass color. I frequently eliminated the attack, which makes it a little harder to recognize the instrument without its characteristic volume envelope, but also makes a more homogenous brown-purple color for the duration of the sound. What are you aiming for when you write? Do you start with a fully realized idea and then decompose it, or do you more often find yourself starting with one part and piling on from there? I don't sit down to write a song knowing what it will sound like in the end. I find that trying to aim for a specific outcome is too limiting. I want to make happy mistakes and follow them to wherever they may lead. Typically, I try to make a compelling song with the bare minimum of components, one melodic instrument and a few minimal percussive elements. As I add parts and layers, I'm always trying to keep only what is absolutely necessary. Sometimes I end up with a very layered song, like "Elevators, Escalators," or "Dibs," but I don't want to add layers just as a shortcut to creating depth. The style of music that you make could be classified as IDM/electronic/glitch. Does writing in this instrumental form inhibit you from instilling some sort of greater message or theme, or at least the type of message or theme that can be formulated through a song with lyrics and/or song titles that are less obscure? The greater theme of my music is simple: pay attention to the details. I don't mean just in my own music, but in life in general. Some of the most beautiful things are tiny, go unnoticed, or are overlooked because we see them as commonplace. I use a lot of sounds in my music that we all encounter every day, but that we don't ordinarily think to appreciate. There are a lot of rewarding little details in the music that only become apparent upon close listen - getting used to scouring things on this level can open our eyes to a lot that we ordinarily miss. I think lyrics would actually get in the way of this message. Previous releases of yours - the Build Buildings EP, Desmostylus (New Animals), and the recent Isomers EP - have been given away as free downloads from your website. What is the thought process behind giving away multiple records at a time, for nothing in return? I started giving my music away for free because I really wanted to ensure that the music would be out there. I make music for people to listen to. I can't imagine putting the time and effort into my work that I do and feeling like I couldn't share it with other people. Saying this, I do have albums for sale, which I consider to be my most complete and best work. I hope that the audience I have gained by giving away music for free recognizes this and wants to hear the best I have to offer. With the release of Ceiling Lights from Street, I'll have some new free music on my website, but it will require a little bit of detective work on the part of the listener to find it! The Isomers EP is a collaborative effort with Marlo Bright. How did you get hooked up with Vlad Pokatayev and the Standard Klik Music label? Do you plan on doing more work with either in the future? I met Vlad, aka Marlo Bright, via MySpace, and became a fan of his music. I think we share a lot of the same philosophy in music: an emphasis on small details, minimal melodies and atypical beats. Vlad had made a demo remix of "Plow" that I really liked, which spurred us to do a couple remixes of each other's songs. We had some good initial results, so the project grew a bit. As it ended up, the album we made [Isomers EP] is less a series of remixes, and more an integrated collaboration that stands on its own. We shopped the album around to a few netlabels, and ended up going with Standard Klik - which is now is now IOD, a free netlabel offshoot of the SEM Label - because we really liked their back catalogue, and thought our album would be a good fit. As yet, we have no plans for anything, although Vlad and I keep in touch and we hope to collaborate again in the future. What can we expect from the upcoming full-length release of Ceiling Lights from Street? Is there a comprehensive theme or mood behind it? Ceiling Lights from Street is a 12-song album with a bit of a narrower focus than There's a Problem With My Tape Recorder. For this album, I delved into sounds that are deep purples, reds, pinks, and blues, according to my synesthesia, and I really aimed to tease out nuances among these colors in different tracks. I took this narrow focus to highlight the subtle details of timbre that you hear in my music. Did you write and record the forthcoming album under similar processes as those in the past? I suppose this is my "guitar album," although for most of the tracks, a casual listen wouldn't really reveal that. I did a lot more of the composition on guitar as opposed to computer, which I think gives the album a nice looseness, especially on tracks like "Skatal" or "Finding Seeds." In the end, the guitar sounds on a lot of songs (like the drone on "This m., Plus" or the bulk of the melody on "Letter Codes") don't sound like guitar at all, but they still retain a rich organic quality. What is the significance behind the title Ceiling Lights from Street? Ceiling Lights from Street refers to encountering something sublime or moving in an unlikely place. I've been struck a few times walking around New York at dusk and looking up through the windows of buildings to see ceiling lights in beautiful subtle patterns that were surely not planned for the aesthetic experience of the sidewalk passer-by. That feeling is something I try to instill in my music, too. To take a sound from the environment and reposition it in such a way that the listener can approach the sounds of their environment from a new perspective. Our world is full of amazing everyday sounds that we take for granted - I want my listener to reconsider that. Beyond this new album, what other plans do you have for the future? Any thoughts to work with other artists, labels, or even a vocalist or MC somewhere down the line? My plans are for more music! I have a song on the upcoming Diaspora 5 compilation on Neo Ouija, which marks the return of the label after a several year hiatus. Aside from that I've got a few collaborations in the works, including Ceiling Lights from Street remixes by Marlo Bright, Main Sequence and Social Society, and a project with the Brooklyn-based singer Bell. And of course, I'm also working on material for the next Build Buildings full-length, too! Readers should be sure to visit our mp3 stream/downloads section on the front page and for a listen to two new songs from the new album Ceiling Lights From Street - "Letter Codes" and "This m., Plus" - available for a limited time from LAS.